I've been trying to play along with more clean and simple challenges, so today I worked on the new sketch from CAS(E) this sketch! It's a really awesome sketch huh? I loved it. 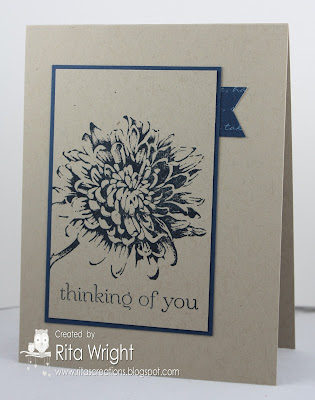 I wanted to make up some cards to send to my granny, so I did a thinking of you card with flower. It got a bit chilly again here in Texas, so we had put on our pants and long-sleeves to go to the library today. We had a great time again and met a nice mom and her little guy Parker. I had a rough day today, so I tried to find a little time to stamp to take my mind off some things. 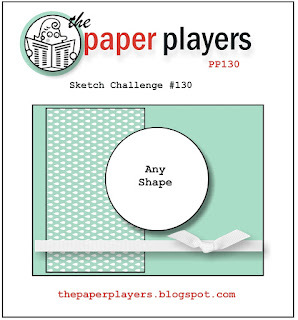 I wanted to play along with LeAnne's sketch at The Paper Players, so I grabbed some new goodies and got to work! Now my brain must have been half working because I stamped one of the bunnies and cut the layers in Calypso Coral and didn't realize it should be Tangerine Tango until I went to put the ribbon on. Duh! I fixed it and I think it turned out pretty darn cute! Aren't those bunnies CUTE?! As soon as I saw them I had to have them. I don't get to order a lot these days, but that was one stamp that I just couldn't pass up. 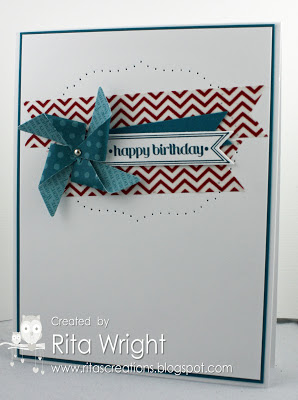 The designer paper and ribbon are two of the awesome choices for Sale-a-bration, so you could earn those for free. I love free! It's easy on the budget. 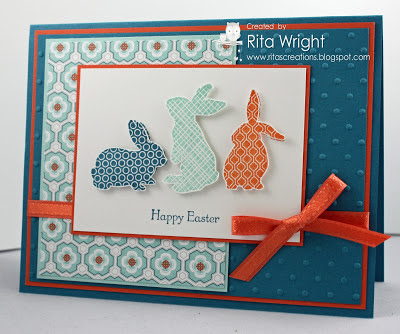 ;) I know it's early for Easter, but I just had to use that stamp. Still no crawling, but she's a rolling champion. I think we have some serious teething going on right now as the drooling is so out of control! 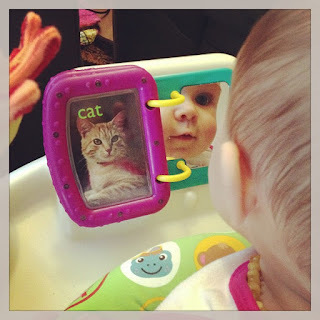 She hasn't been too fussy, but we can definitely tell that something is a bit off. I hope she's feeling good tomorrow because we've started going to the infant program at the library on Thursdays and I love it. I've met a few nice moms already and enjoy talking a bit with them. Happy Wednesday! I'm hoping for a happy Wednesday anyway. Tuesday...well Tuesday was NOT so good. Today is Freshly Made Sketches Day though! My buddy Linda designed the sketch this week and it's another fun one. 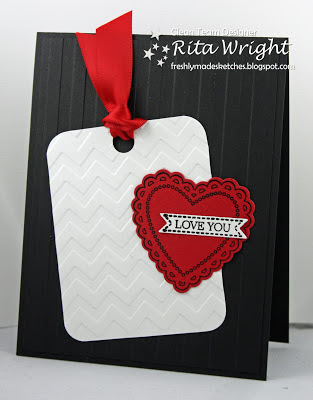 I love tags but never remember to use them. I love when a sketch comes along to remind me to use them, so thanks, Linda!! Still plugging away at my goal to master the art of clean-and-simple. I had the idea for this card the other day but hadn't found the time to stamp it out until today. It mimics my sketch from last week's Freshly Made Sketches challenge. 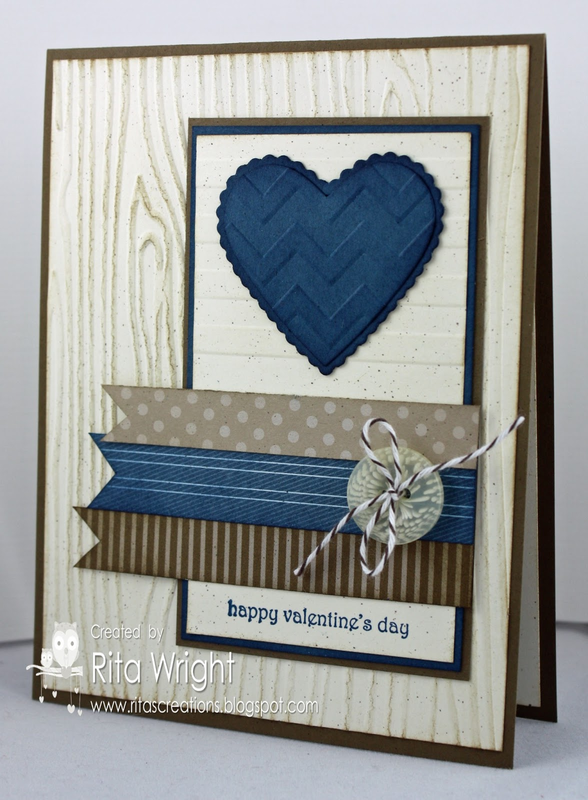 I used a favorite color combination, Baja Breeze, Rich Razzleberry, and Island Indigo. 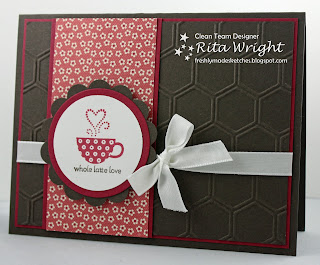 Lacy & Lovely was the set I used my awesome 25% discount from Stampin' Up! on. I love the perks of being a demonstrator. 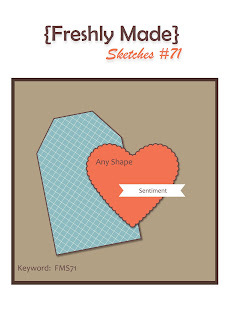 :) It's a great set because it has shapes AND sentiments! 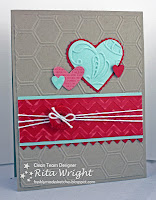 You can make simple cards like this one, or go all out and make a fancy one. I added some bling because well, who doesn't like rhinestones?! I snapped this cool picture of Laila playing in her Exersaucer over the weekend. She gets very fascinated by the baby in the mirror. I try to make up a little thank you card or gift for my awesome club ladies. They are not just customers, but great friends as well. Sometimes I run out of time and fail at that, but I tried really hard this month to stamp a card for them. Laila was a good girl and played in her Exersaucer so I could get them done. They are simple, but cute. I just love this sketch and have used it a few times in the past. The Big Shot and punches to all the work which is great when you are running short on time! 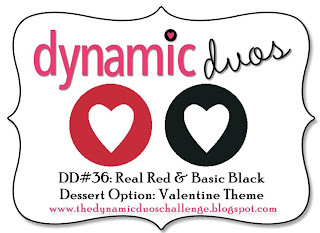 Add in the awesome combination of red and black and you have a winner, right?! 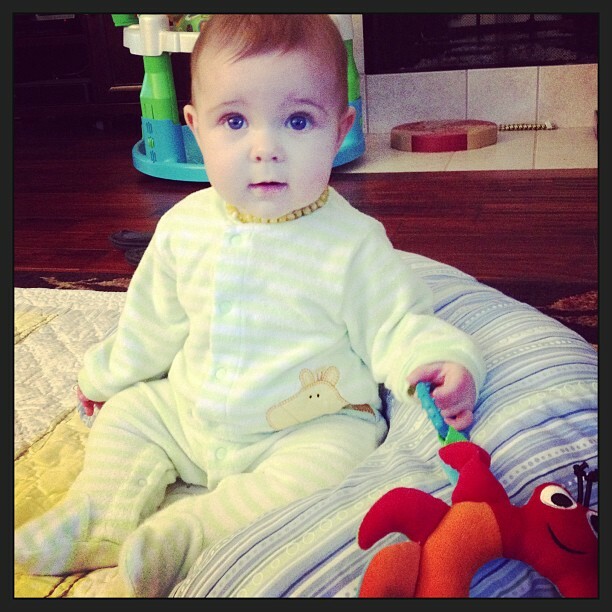 Can you believe she's seven months old today?! It is going by so, so fast. I guess I should start thinking about some birthday ideas before too long. I wanted to do some crafty stuff for it and I will need time to work on them! I'm thinking owls, but I need to see what all is out there and what colors I want to work with. 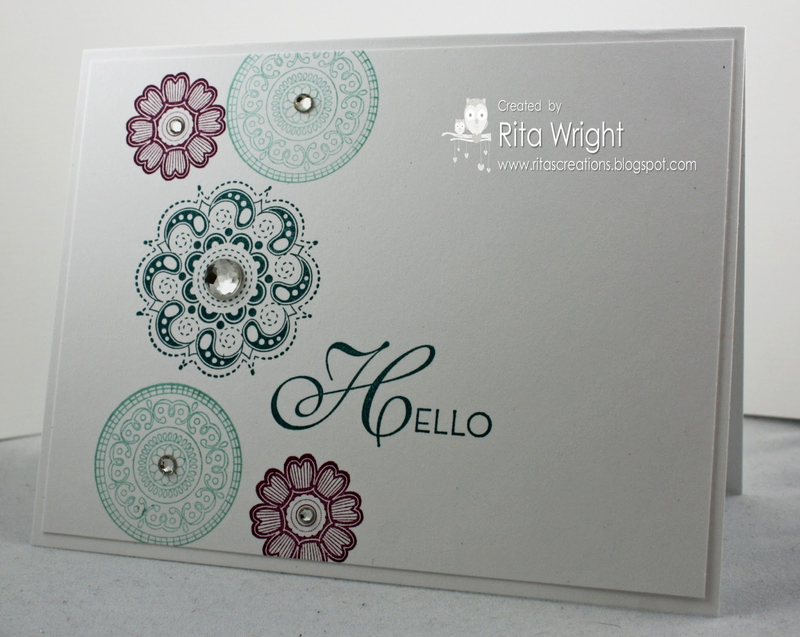 I managed to fit in a little stamping time today and wanted to do a couple challenges that I had on my list. I don't seem to find as much time to do them lately and I really do miss that. I decided to try and combine the colors from Fab Friday with the sketch at Try Stampin' on Tuesday. I should have snapped a picture of my desk after this attempt so you could see how many times I cut different paper for the base and layers. I struggled to say the least! I used the fun SAB set, Patterned Occasions, again for this one. It's such a cute set and definitely one I'd recommend getting! I stamped it three times and kinda cut and pieced the colors I wanted together. For some reason when I stamp a cupcake I want to put a flower on it, so I did...again. :) I think it ended up turning out kinda cute, but it was definitely a challenging card for me. Laila is up from her nap, so I'm going to cut this one short! 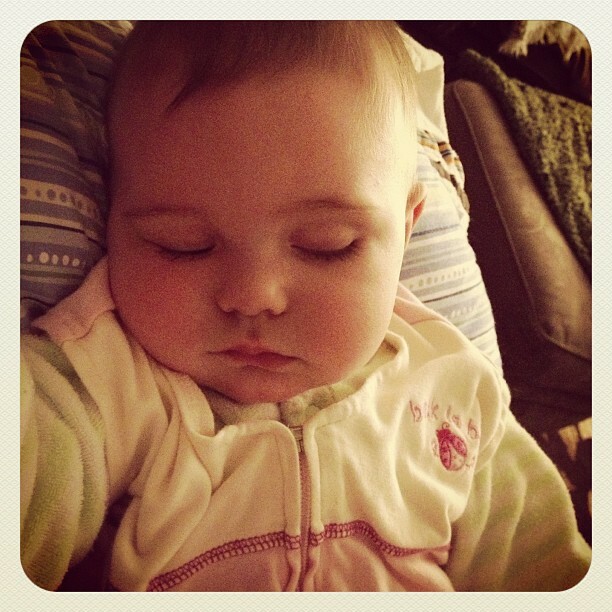 I finally felt like I could handle seeing her in her Little Sister onesie today. Today at Freshly Made Sketches I am the hostess! I created this fairly simple sketch with the idea that it would work with a wide range of styles. Even though I'm in a bit of a clean-and-simple mode, I added in some layers and went more for just clean. 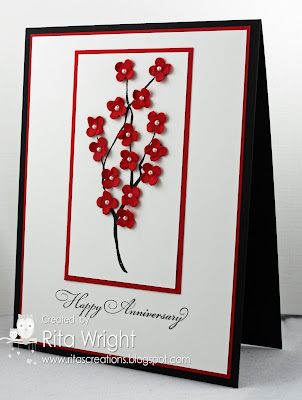 This card is one of those special cards that was made with someone in mind. :) A few months ago I received an email in the middle of the night from one of my readers, Andrea. 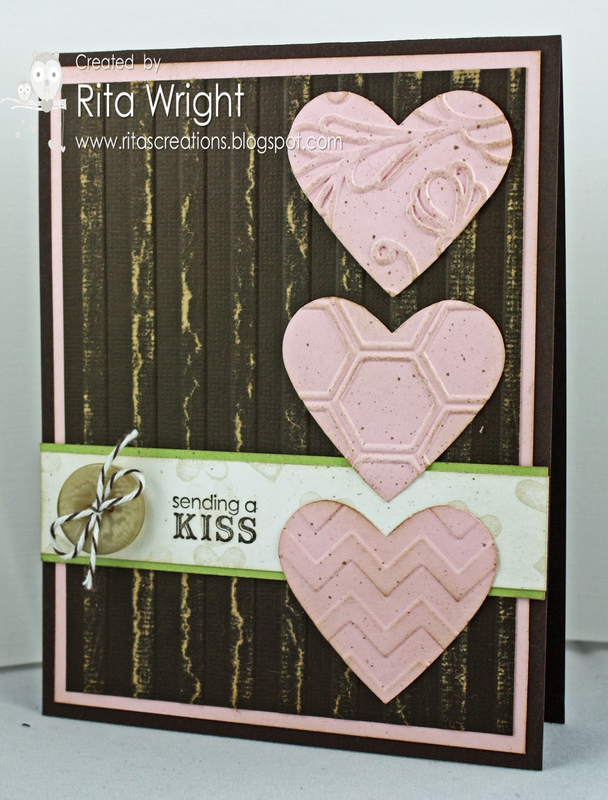 She noticed that Stampin' Up! had updated the Clearance Rack and that the Spice Cake DSP was on it. She knew I was hoarding what I had left and wanted to make sure I was able to get some. Sweet, right? I wasn't able to order because of bills and holiday spending, but I soon got an email that she was sending a pack my way. I'm pretty sure I cried a bit. It's amazing when someone you've never met does something so nice for you and I feel lucky that my blog has brought her and other sweet people like her into my life. Andrea says I inspired her to purchase the Fun Flowers die, so I thought it was only fitting that I use it on the card I made for her. :) It is probably my favorite die and if you don't have it yet, I'd highly recommend it. Now that Sale-a-Bration has started, it is the perfect time to get it too! It's a little different than my sketch, but the idea is still there. 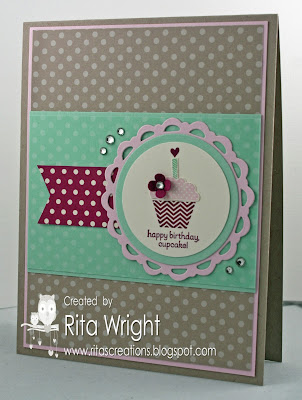 Don't forget that I have card kits available. 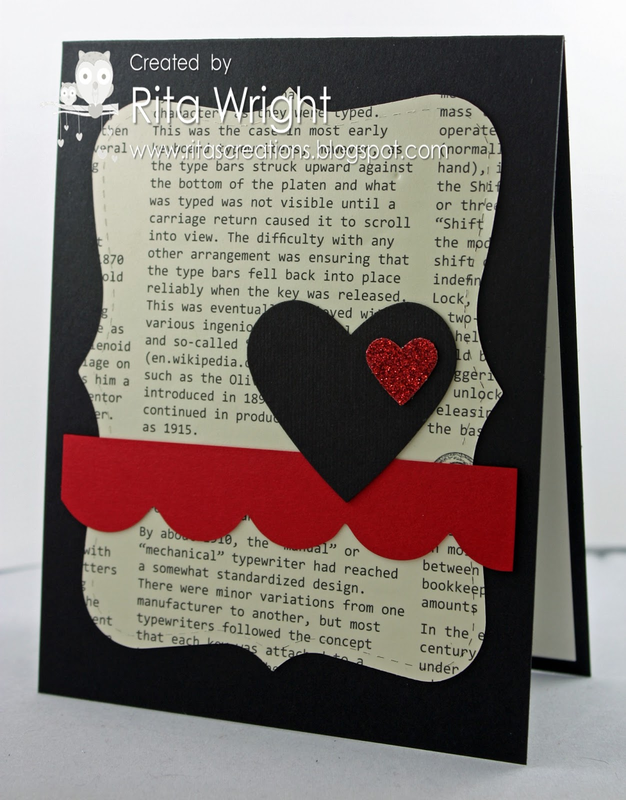 :) You know your valentine would love a gorgeous hand-stamped card. It's the perfect way to say I love you. Each kit is $16 which includes shipping and PayPal fees. They will ship on approximately January 25th but could be a little later depending on when I receive your order. 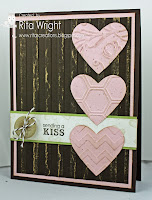 The kits will contain all the card stock and designer paper to make the 4 cards pictured below. I do reserve the right to substitute patterns if necessary. Embellishments and ribbon will be included but may differ from the original cards. They will still coordinate I promise! 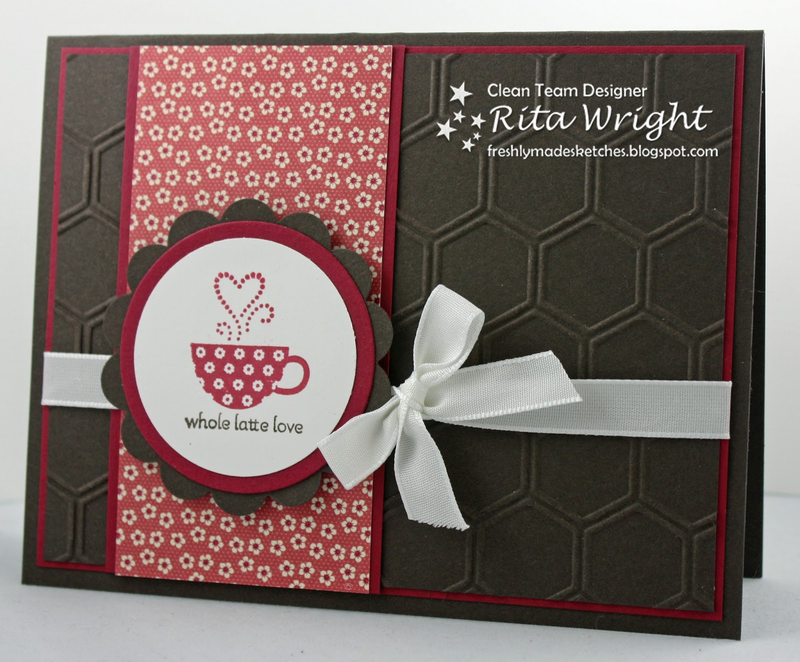 No stamping will be included per Stampin' Up! policy, so you will need to provide your own stamps/sentiments. Detailed instructions are NOT included, but of course I'll be here to help if you get stuck. 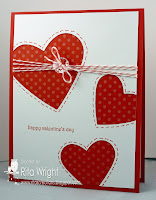 :) You will received a card kit PDF that includes a photo and a list of supplies used to make the cards. To purchase, you can click on the Buy Now button below and it should take you through the payment through PayPal. Please let me know if you run into any issues with it. 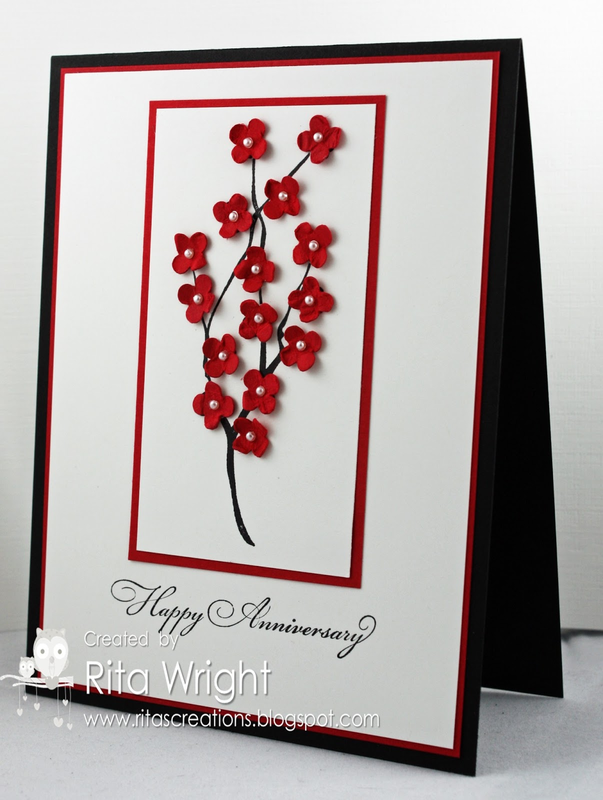 If you'd like the cards made for you, the cost of the 4 completed, stamped cards is $20. Please email me if you'd like this option and I can send you an invoice for that. 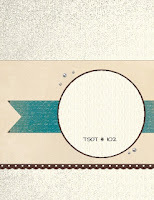 These will include the angel policy stamp on the back of the cards. After two days of twenty minute naps, Laila finally crashed for a bit today. I was thankful for the break and headed to my room to try to stamp a bit. 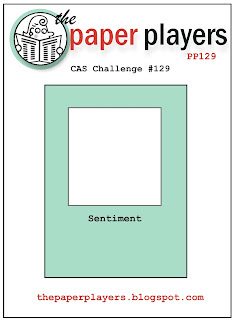 I decided to combine the clean-and-simple sketch at The Paper Players with the colors at Dynamic Duos. We've been doing a lot of floor time lately, but still no crawling. She is learning to roll back and forth pretty good though. I'm in no rush for her to become mobile because I know once it happens we are going to be chasing her all over the place! That girl has some serious energy! 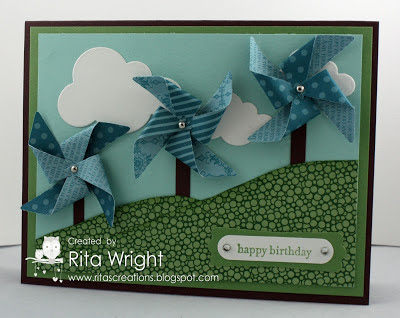 I thought I'd share my original pinwheel card. I thought it turned out okay, but it just wasn't the fun card I'd imagined in my head so I changed the colors to the one you saw on my Freshly Made Sketches post. I love the design of this one, so I might make up a few more in different colors. That die is just so easy to use that I love playing with it. She's really got the hang of sitting up playing now! She loves eating her pureed solids that we've been making for her too. I don't know if her having 3 little meals is the key or not, but she's slept 10-12 hours for the past few nights. It's been kinda nice. I know she'll change that up when we least expect it, but I'll enjoy it for as long as it lasts. Since I've decided to work on some CAS skills, I thought it might be fun to try out a couple of challenges that are just for that! 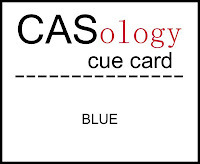 I am combining the sketch at clean&simple with the cue at CASology. I guess I should have printed out the sketch instead of doing it from memory. :) I guess my brain can't even handle something that simple these days. I am having a second cup of coffee, so maybe that will help me the rest of the day. 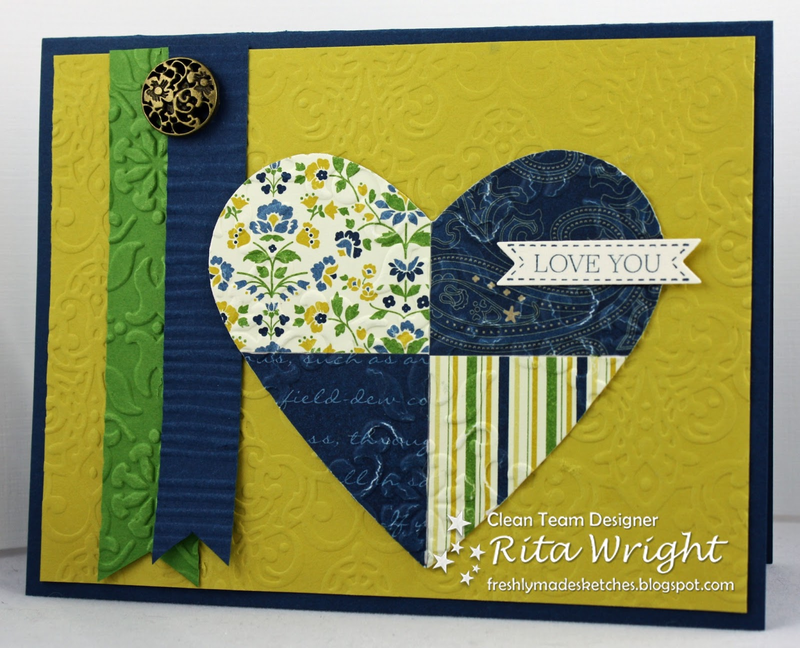 I used one of my favorite tools, the Fun Flowers die, and two of my favorite colors. Simple, but sometimes simple is good, right? I just love this girl. We are having such a good week! LOL Gotta love a messy pea-covered face! :) We had a nice day today. We went to the infant program at the library and she did great. I hope we can go again, but they always seems to fall during her nap times. She took an early nap today so we were able to hurry and get ready for it. I really need more social interaction and it was nice to chat a bit with the mom next to me. 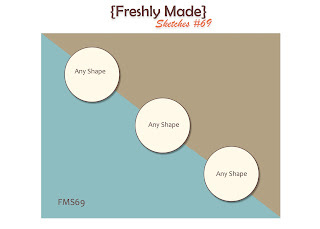 It's time for a new challenge at Freshly Made Sketches! 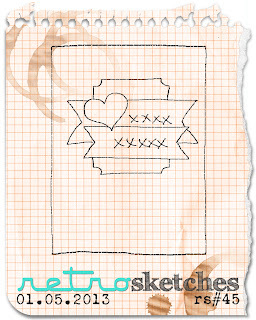 This week is special because our dear Linda S. is the hostess and this is her very first sketch. Exciting, huh?! Now I hope she won't mind that I took a lot of liberties with it. I totally dreamed up this card one night as I was thinking about the sketch and for once, the reality was even better! I am happy to say that I actually like this one. :) I'm usually my own worst critic, so I probably need to frame it and keep it. I'm really beginning to wonder how we are going to live without Pool Party. Island Indigo too really. I just love those colors. I mean I guess I can go back to Baja Breeze and Not Quite Navy, but I really do love these guys too. Sigh. Change, we can handle it, right? Maybe SU will be nice and somehow add them to the next catalog. Do you like the pinwheels? 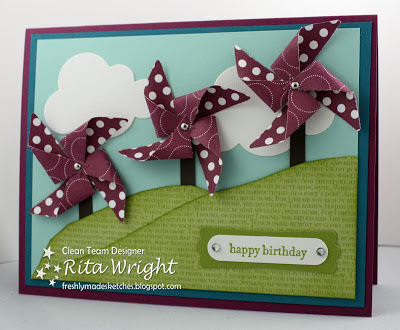 I love pinwheels and the new die in the Spring catalog makes it so easy to make them! I am stoked that I bought it now. No more trying to punch holes in darn paper; the die does that for me! A certain someone is growing up way too fast! I think she's teething AGAIN (does it ever really stop once they start?! 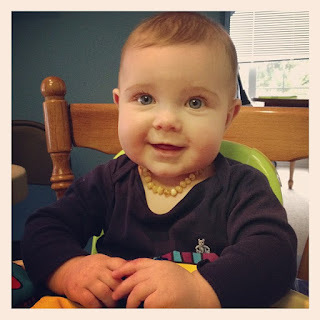 ), so we are trying an amber teething necklace. My husband thinks it's a bit crazy, but I'm up for anything that might help her feel better. She refuses to chew on anything except for her hands and fingers so we are having to put lanolin on them to help with the chapping and redness. 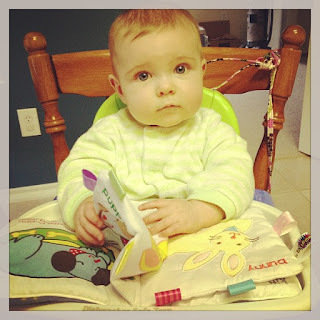 She's really enjoying her solid foods and we are having a blast making baby food for her. I hope to be back on Tuesday with a card and maybe an announcement of a new business venture, but for now my goal is just to survive tomorrow. 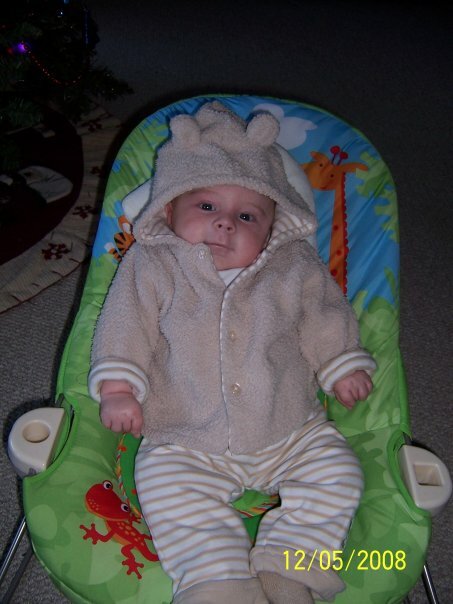 January 14, 2009 was the last day that I got to hold my sweet Eli. At at little after 7pm that night he took his last breath in my arms. I'll never forget that moment. If you haven't heard about SMA, I would love for you to take a few minutes today to learn about it. 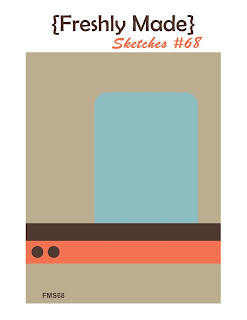 It's time for a new sketch at Freshly Made Sketches! 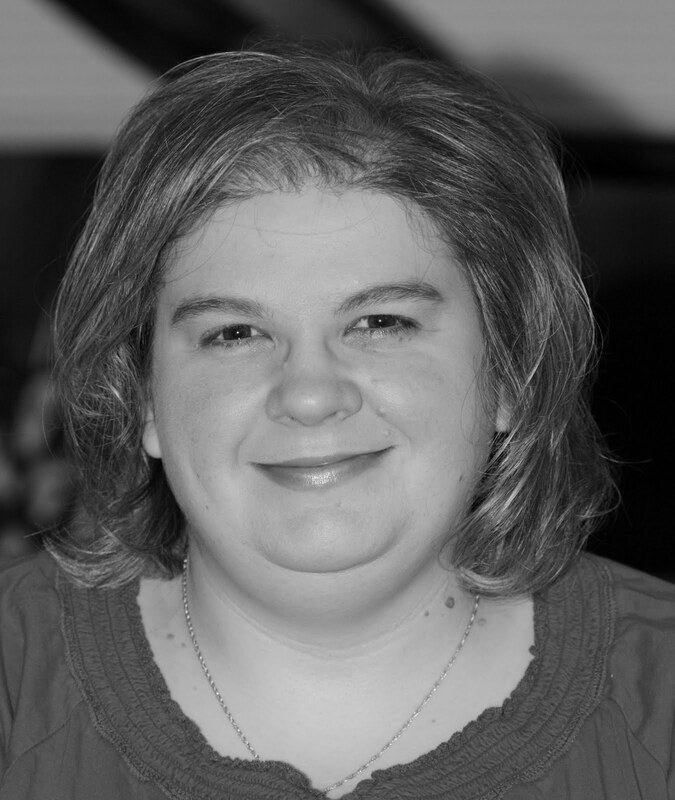 This week Jen Mitchell is our hostess and sketch designer. We have had some great versatile sketches lately and this is another one that can do so many things. So I can't lie, this isn't my favorite card. I promised myself I'd give new things a try in the new year, but Summer Starfruit and I will never be friends. I thought I'd give it a chance and I did. I just can't do it though. It's not a color that looks good to my eye. I know other people love it and I'll leave it for them. :) Now Gumball Green and Midnight Muse? I love those guys! They are awesome. 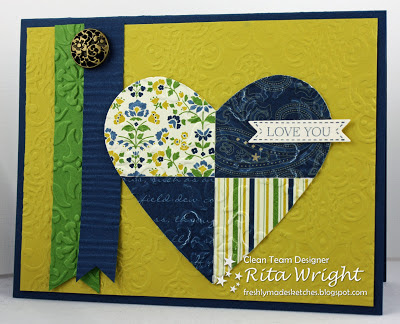 But anyway, this is a clean version of the quilted heart with lots of different embossing folders. 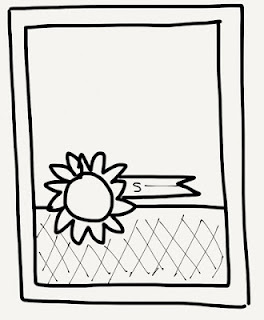 This one could almost be manly if it wasn't for the flowers on the one panel. Laila has been so great about sitting in her chair after eating so that we can eat or clean the kitchen. Yesterday she was sitting there flipping the pages of her book like a big girl. I try to read to her a lot in hopes of her loving books as much as I do.